Long ago, the continents were one large landmass, but this landmass was not a single structure but rather a large conglomerate of continents and ocean floor on their own massive chunks. It is now accepted among most geologists that these chunks “float” on a semi-solid mass of magma. Then the massive continent broke apart and began its multi-million year journey around the world. Today, one of these pieces is being rammed into the west coast of North America. The young volcanic mountains reaching towards the sky, and frequent earthquakes, as one chunk slides underneath another are only two indications of the restlessness of the Earth. The mountains of the Pacific Northwest, Mt St Helens, Mt Adams and Mt Hood in particular, are of note in this tale. At the time of the story, these three wonders of the Pacific Northwest rose majestically over the Cascades, casting their snowy shadows on the Columbia River and the Plateau. But, closer to the river is the small mountain that fueled this tale. Table Mountain, a typically restless small peak, was being slowly eaten away by the waters of the Columbia River. Its steep slopes soon gave way to gravity in a massive landslide, temporarily damming the river and making it possible to travel from Washington to Oregon and not get your feet wet. This slide, rather a series of slides one on top of and next to another, became known as the Bonneville Slide Complex. The river eventually overtopped the dam, washing it out and creating the Cascades at the Dalles (and a bothersome portage for Lewis and Clark). 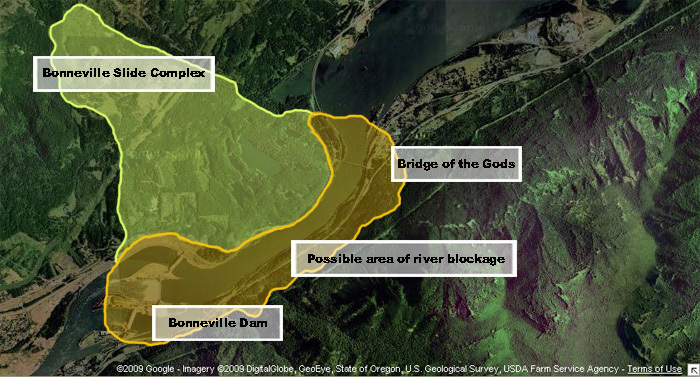 The massive boulders of the original Bridge of the Gods still exist, buried under hundreds of feet of water behind the Bonneville Dam.